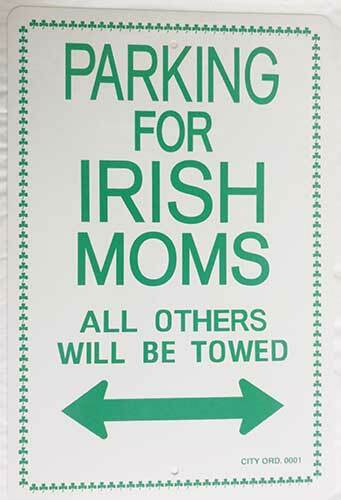 Parking for Irish Moms is the designation on this Irish sign that is perfect for your garage or bar. This Irish sign says Parking for Irish Moms - All Other Will Be Towed. This white plastic Irish sign features green print and is surrounded by a border of shamrocks. The Irish moms parking sign measures 12” wide x 18” tall. The Irish parking sign is ready to hang and it is complete with a shamrock history card, complements of The Irish Gift House. Parking for Irish Dads is the designation on this Irish sign that is perfect for your garage or bar. Parking for Irish Policemen is the designation on this Irish sign that is perfect for your garage or bar. Parking for Irish Firemen is the designation on this Irish sign that is perfect for your garage or bar. Parking for Guinness Drinkers Only is the message on this Irish sign that is perfect for your garage or bar.